P.S. Thanks to those who have answered the poll in my sidebar. >wow that looks time consuming! looks great though! >This is just AWESOME!!! 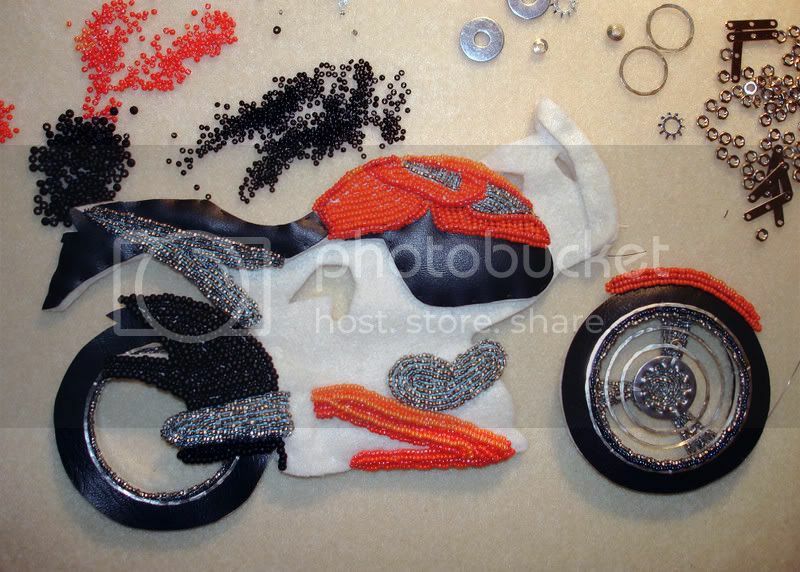 Have you ever considered embellishing a full sized motorcycle? I actually toy with the idea of beading or somehow embellishing my Volvo. The idea horrifies both of my kids…all the more reason to consider it…. >Looking good! It still amazes me. >This is looking so cool! >It’s looking really great!! will book mark it and show the hubby when he gets home. I had left some color suggestions on your other post that were his. He’ll be interested in what colors you have chosen. >Man…all those small beads. the craftswomanship..
>oh my goodness – this is awesome!